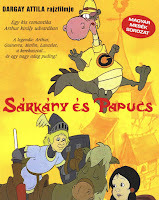 What, you thought Hungary would be the only European country that doesn't have its own King Arthur adaptation? When a misplaced love potion turns Sir Lancelot into the stalker from Hell, King Arthur sends him on a fool's errand to fight a dragon and retrieve Queen Ginevra's slipper. 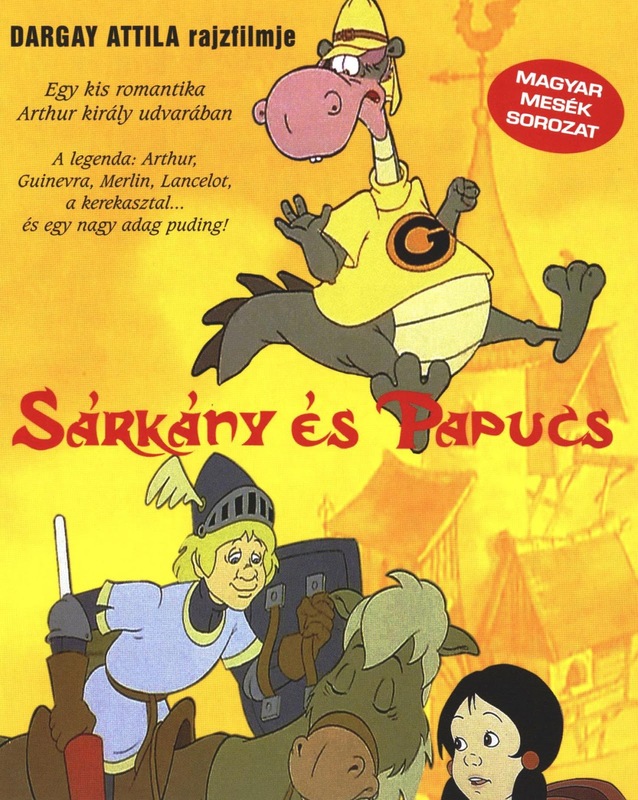 Sárkány és papucs (Dragon and slipper, 1989) is a feature length animated movie set in King Arthur's court. It is introduced and narrated by the court jester, who tells us all up front that he is the sanest person in Camelot. King Arthur's days are taken up by his boys' club - he spends all his time in their company, watching jousting matches and regaling the knights with his abysmal storytelling skills. Queen Ginevra, in the meantime, feels completely neglected (she doesn't even remember when she was last kissed) and shares her distress with Peggy, the clever handmaiden. The two women order a love potion from Merlin to rekindle Arthur's love for his wife - however, the pudding the potion is baked into accidentally ends up on Sir Lancelot's plate. The (overdosed) love potion turns Lancelot into a raving madman - there is a 3 minute long scene of him just screaming GINEVRAAAA all over Camelot at night (which is mostly what the movie is known for among distressed parents with small children). Peggy cries her eyes out (she is in love with Lancelot) and the Queen is worn down by the knight's advances - she loses sleep, then her hair, then her teeth, until finally her entire tower is set on fire by Lancelot's burning love message. 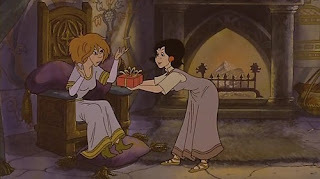 The Queen complains to Arthur (who is the only person completely oblivious of what's going on), and gives him an ultimatum: Either her, or Lancelot. King Arthur sends his knight on a fake errand, claiming that a dragon stole the Queen's slipper. 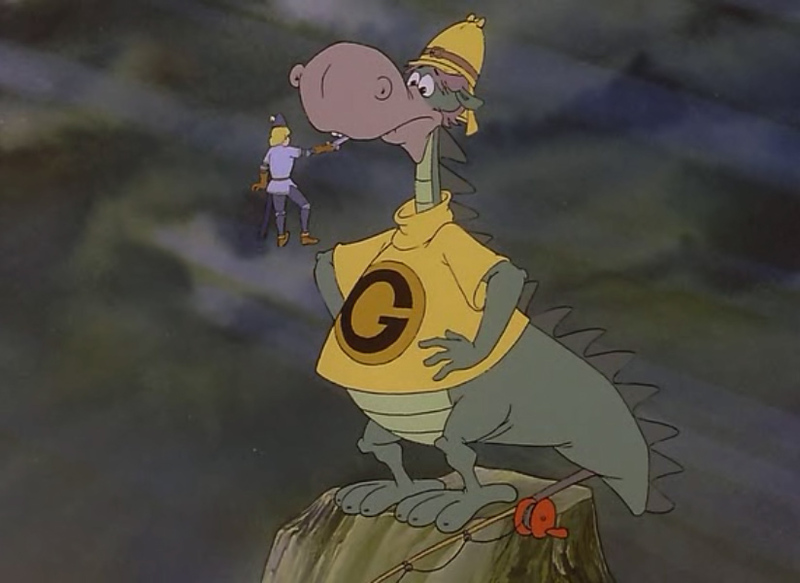 Lancelot immediately sets out with his faithful (albeit passive-aggressive) horse Oliver to harass the region's only dragon, Dr. Goliat. The fight against the reluctant, soft-hearted dragon (who only wants to be left alone to fish in peace - "Why would I steal a woman's slipper?! I'm not a fetishist!") finally sobers him up, and Peggy arrives just in time to reclaim her lost love. "Not doctor. Draco! Draco, draconis, masculine. Don't you speak Latin?! Go to hell, then." It was a very applicable quote all through my college Latin studies. Incidentally, it is also applicable to professors in certain contexts. Similarly quotable is Lancelot's resigned steed Oliver, who does not want to do any of the questing business (and simply calls his owner "the idiot"). His go-to response to everything is "Well, this is stupid... but what can a horse do about it?..." You can watch the film (in Hungarian) here. I'm sure I'd enjoy it. Even reading the synopsis was fun! This is too funny. Sounds like another cartoon really made for adults. Your explanation of these is even funnier than I suspect the programme is! Oh, wow! I am in awe and giggling. That sounds absolutely hilarious. I always thought Lancelot was a 'tard, but -- wow. Just wow. thanks ,i see this movie when i was a kid ,today i remmember saw it and i went like crazy trying to find his name :) it is a great movie by the way ! Hi, I've been looking for this movie for about 10 years and it has driven me nuts! I remember watching this when I was a kid with my sister. We used to mock Lancelot going nuts. Anyways, this discovery honestly made my day, however, I'm having the hardest time to find the movie online, do you know where are you I can watch it in spanish or english? Now that I know its a hungarian film, I wonder how it got to Mexico, and translated! Cuz I remember Lancelot's voice in spanish... Anyways, if you can help it would be very appreciated.